O'Neil's on Grand River Avenue in East Lansing. I’m not a morning person. The fact that I’m even up for breakfast means there was something else going on that caused me to get up. I was at DeMartin Stadium for a soccer game on a Sunday morning. J told me to call her when I got my lunch (breakfast) break and she would meet me somewhere in East Lansing for breakfast. 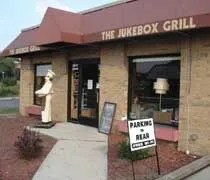 I was released for lunch at 9:00 and I called J and told her to meet me at the Jukebox Grill for breakfast. I know you’re confused by now because I just called it The Jukebox Grill, but the title is O’Neil’s. I’m guessing they just changed the name to O’Neil’s very recently. The menus now say O’Neil’s and we were given a coupon that says they are now called O’Neil’s (formerly Jukebox Grill). The outside of the building still says The Jukebox Grill, but there’s also a sign in the window that says O’Neil’s. So, since everything said O’Neil’s, that’s what I’m going with.